My Softwares - “You must love designing for a living"
This is made from VB6 splash screen. Combined with spinning logo and a progress bar loading like a pedestrian lane. hehe.. Beta Version of course. To explain what is beta version , it is a classification of a software next to alpha. Wahaha... That's all for TODAY. This is the main form of the system. 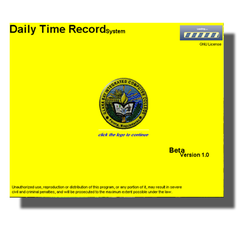 The red caption,"Daily Time Record" is actually flashing. The logo is also spinning like in the splash screen. If the combo box is being clicked, the list of the employee will be shown. Just click the Smiley button to log the selected employee. A calendar is also displayed. No action for this, since it's intended for date display. 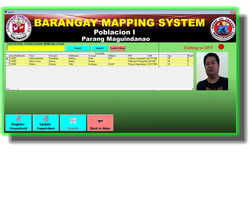 The two white areas will show the list of the logged employee as will as the absent employees entered by the personnel. Anyway, only the personnel is authorized for this action. Any one can make an announcement that will be displayed at the bottom of the screen. 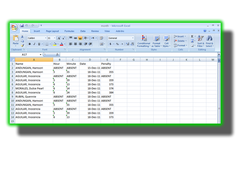 All action made everyday(Log and absent) are being saved in a database which this time an excel file. The personnel may print it sort it and do whatever she wants, even dropping the database hehehe. The database will save the name, date, time, reason for absence as well as the penalty for tardiness. Anu daw? This is actually the sensitive feature of this program. 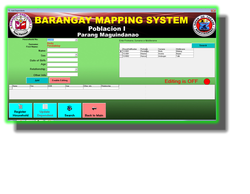 The personnel will click the back up button in the main form and the figure at the left be shown. 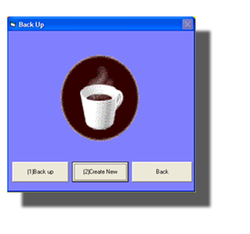 And this is intended for backing up the database, monthly. So delicate since there is no automatic backing up for the monthly actions(Log and Absent). Oh so hard.... at this part..... see u on my next post. 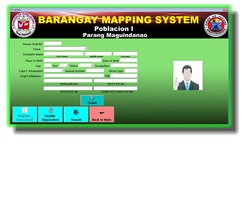 This mapping system is the same as Admission System since it has the feature of registering a household to the database. After registration, that household can have dependents or to say register a dependent to that registered user. See the other form for the other details. To register a household, just click the household button at the main form. Then the picture on the left will be shown. You will be asked by the system to enter a valid household number. This is validated(checker/secretary) before it will be encoded in the system. Other information will be ask also, including the photo of the household. 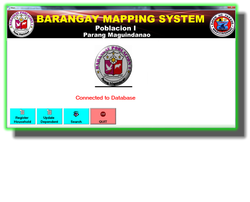 The search feature will accept search by Firstname, search by Surname, search by middlename or search by Purok. You can also edit/delete the information of the household here, just click the enable editing button.